RAINBOW (1885) The 351 ton whaling bark Rainbow was crushed in the ice and lost near Mys Navarin, Russia April 14, 1885. The vessel sailed out of San Francisco December 10, 1884 bound for the North Pacific whaling. She sank in 20 minutes and was a total loss along with her cargo of whale bone. The Ram, valued at $1,600, was a total loss. The crew managed to find safety. There was no insurance. RAVALLI (1918) The 1,305 ton 186 foot wooden single screw steamer Ravalli caught fire and was lost in Lowe Inlet June 14, 1918. Spontaneous combustion of coal in the storage bins caused the blaze. The vessel sailed from Seattle bound for Quadra and other southeast Alaska ports. She had 50 passengers and 30 crewmen on board and was carrying 832 tons of cargo with a small quantity on deck. The steamer Venture and three launches came to the assistance of the Ravalli and all passengers and crew made it to safety. The three launches towed the Ravalli part of the way across the inlet and pumped water into the burning vessel. She sank in 10 fathoms of water. The Ravalli was valued at $150,000 and was a total loss as was almost all of her cargo. The casualty report stated the machinery from the vessel may be salvaged but in a damaged condition. The Ravalli was insured for $126,000. RAVEN (1994) The 98 foot steel tug Raven sank in 65 fathoms of water November 23, 1994. The vessel had recently been salvaged after sinking in Dutch Harbor in April 31, 1994 while towing a Sealand Ship. The 165 foot fishing vessel Pacific Knight was towing the Raven to Seattle for repairs when she began taking on water. Unable to control the flooding, the crew of the Pacific Knight cut the tow line and the Raven sank. RICHARD III (1907) The 985 ton wooden barge Richard III was abandoned by the steamer Alaskan in Clarence Strait January 25, 1907. The Alaskan was forced to cast off from the barge because of a gale and low fuel. The Alaskan proceeded to Niblack for fuel and on her return was unable to locate the Richard III. The barge eventually stranded and was lost in Virago Sound on Graham Island in British Columbia. There was no loss of life. 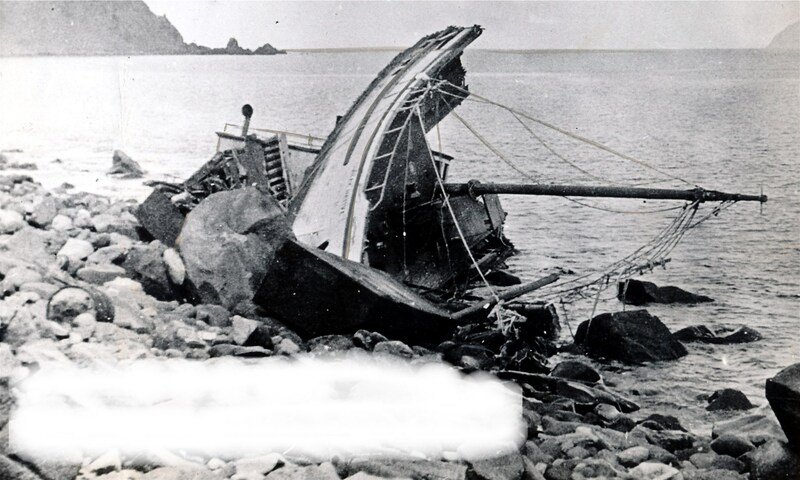 The Roald Amundson, valued at $12,000, and her cargo were total losses. The vessel was insured for $7,000. The cargo of fresh halibut had no insurance. RODGERS (1881) The U S Survey Steamer Rodgers was burned in Saint Lawrence Bay, Siberia in 1881. The crew was rescued by the whaler North Star and transferred to the Revenue Cutter Corwin and taken to Sitka. RONNIE D (1970) The 37 foot steel gasoline powered fishing vessel Ronnie D foundered six miles outside of McArthur Pass.